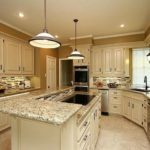 If you are looking for some nice white granite color which is characterized by white and black combination. 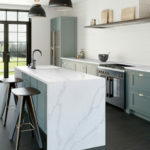 So, using this stone with white cabinets are beyond the inspiration. 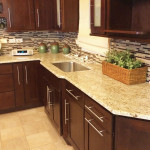 If you decide to design your kitchen with White Spring granite and dark color flooring will be a great combinations. 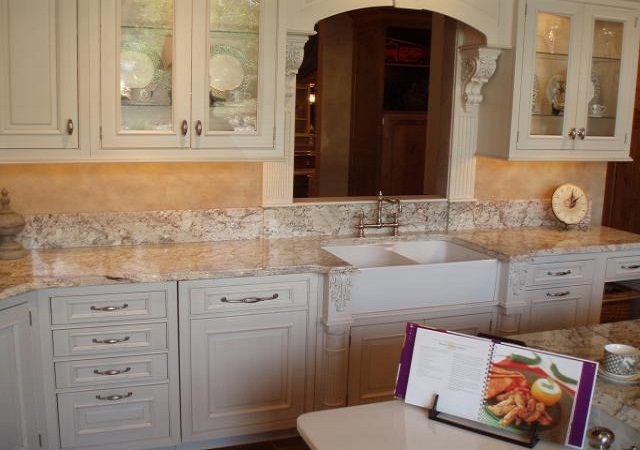 Even though this stone has stunning lovely white bedrock the stone goes well with white cabinets. 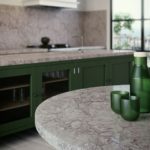 So, White Spring granite is very popular with white cabinets and will never go out of the fashion! 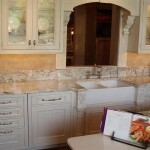 Backsplash options could be either cream beige color or white subway style tiles. Flooring has no other choice for this stone with white cabinets will go only dark hardwood. 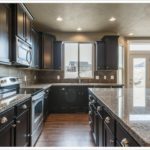 Hopefully my web blog will inspire you while you are making decision with the granite countertop and cabinet colors and of course back splashes and flooring as well. 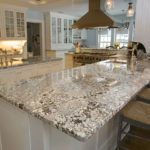 The cost of the 3cm White Spring granite countertop is about $55/square foot for residential installing. 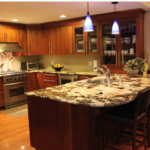 This L shape kitchen with center island has a single bowl D shape stainless steel sink and gooseneck faucet. 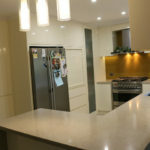 Built in bottom freezer refrigerator along with stainless steel stove and light oak wood flooring made the room so wide. 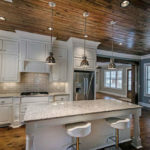 And also pendant lights above the kitchen island surrounded with window and deck door along with recess light made room bright. 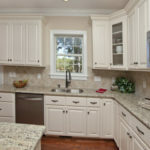 White Spring granite countertops white cabinets and dark wood flooring is the best way of doing for kitchen remodeling. 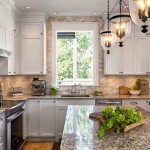 This kitchen has white washed brick backsplash made very soft contrast between the cabinets. 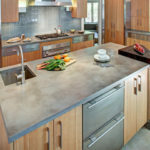 Kitchen center island has corner prep sink made by same granite color to give extra ordinary look with stainless steel main farm sink in the kitchen. 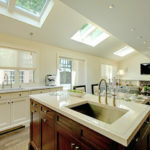 Up to ceiling white cabinets with crown molding featured with recess lights and pendant lamps. 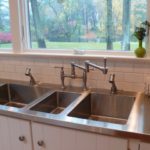 Stainless steel appliances, center island with overhang which supported wooden brackets. 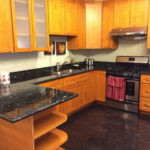 Leather top dark color bar stools added also nice combination for the kitchen remodeling purpose. This is a red oak floor with a custom stain blend surrounded with White Spring granite countertops and white cabinets. 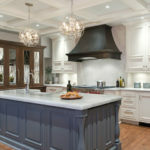 Kitchen island has a 12″ overhang which supported with a custom design posts. This amazing wide open kitchen lay out plan designed with black and white cabinets. 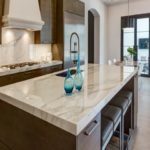 The color combination in this kitchen is perfect which makes a tremendous combinations White Spring granite using the same granite as a full high backsplash between the wall cabinets and countertops. 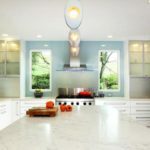 Glass door in lighted wall cabinets with stainless steel stove and build in refrigerator are also added great look for kitchen remodeling ideas. 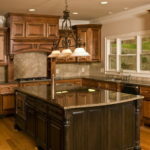 While doing kitchen remodeling backsplash is very important. 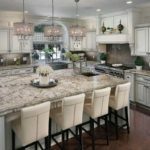 White Spring granite white cabinets on the perimeter section of the kitchen which has also dark color cabinet island inspired with lovely pendants lambs above it. Six burner stainless steel stove and refrigerator added extraordinary combination for kitchen design ideas. 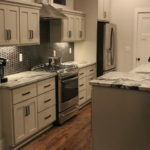 Cherry wood flooring is always a good option when you use white cabinets and white backsplash together. Mary, I really loved your photo. The granite counter tops really make that kitchen. 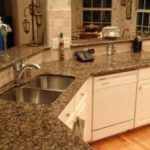 I wished my wife and I went with the granite. I am so sorry to answer you little late but I hope that you change your mind in near future to get granite countertop.